Zero Maintenance: Stainless Steel Construction, No Hydraulics, No leaking Oil. Durability: 1,000,000 Cycles Testing, Many Years of Maintenance Free Operation. Code Compliant: ADA, UL Listed R26997, ANSI/BHMA A156.17 Grade 1. A1 Hinge - Top Position - Controls Closing S peed from 0 -20° and Closing Force. 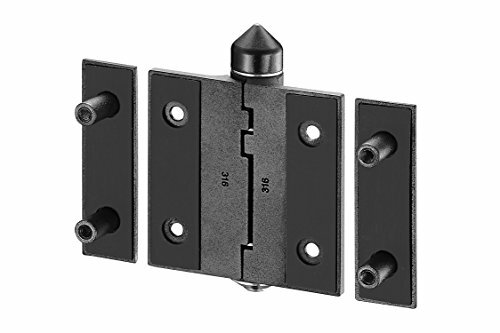 A Hinge - Bottom Postion - Controls Closing Speed from 21 - 90° and Closing Force. Please refer to our instruction manual for detailed operation. Maximum Door Load Per Hinge with auto door-closer function Per Hinge - 110 lbs (50kg). The product lifetime and its maximum loading weight will be influenced by the loading pressure or the set-up of braking graduation. If you have any questions about this product by Waterson, contact us by completing and submitting the form below. If you are looking for a specif part number, please include it with your message.